Add a little token of the Marvel universe to your keys or bag! Hunt and collect miniature Pop! versions of your favorite characters as key chains. Each figure measures approximately 1 1/2-inches tall and comes packaged in a blind bag. This Marvel Pocket Pop! 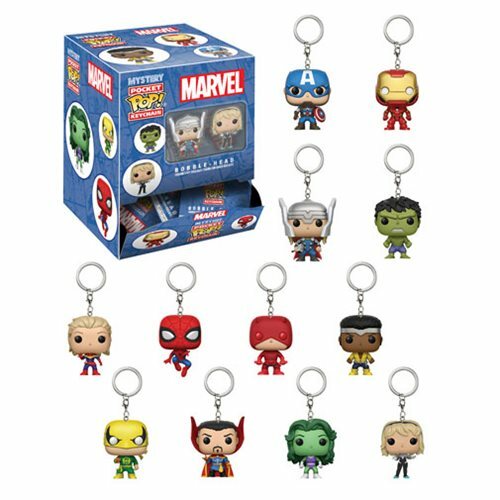 Key Chain set includes Captain America, Iron Man, Thor, Hulk, Captain Marvel, Spider-Man, Daredevil, Luke Cage, Iron Fist, Dr. Strange, She-Hulk, and Spider-Gwen! Who will you get? Ages 3 and up. The Marvel Pocket Pop! Key Chain Random 4-Pack includes a total of 4 individually blind bagged key chains. Breakdown not available at this time. Please note: Item selection is random. Items are in blind packaging. We cannot accept requests for specific items, nor can we accept returns on opened items. You may receive duplicates.